Released on November 18, 2009 by Artist Stations records. Eleven years after the band's previous studio album, "Ocean 2", the least that we can say is that Bornemann and co. did not take many risks with this new opus. 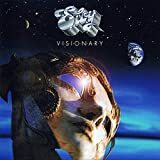 "Visionary" contains conventional and smooth ELOY space rock compositions. Rather consensual, the songs have also been shortened. A noticeable change is the definitive reintegration of Hannes Folberth, ELOY's keyboardist from 1980 to 1984, and invited as a guest on "Ocean 2" for "Ro Setau". The first two tracks incorporate flute. The melancholic "The Refuge" is an efficient soft space rock opener. Maybe the only true innovative passage, as it sometimes sounds like JETHRO TULL. Supported by modern rhythms, "The Secret" is rather calm and enjoyable, although a little long. "Age Of Insanity" is the most interesting track of the record. A punchy fantasy space prog composition featuring nice guitar and keyboards solos. As its title suggests, "The Challenge (Time To Turn Part 2)" is a copycat of the eponymous title track of 1982's "Time to Turn" album. Not much to say about it, except that this variant is not very original. "Summernight Symphony" quite reminds PINK FLOYD's "Comfortably Numb" with its chord progression and hazy ambiance. The slow 9 minutes "Mystery" is the longest song of the record. Rather average, with not many variations, it fails to really lift off and does not justify its length. As a closing track, "Thoughts" is a nice acoustic short piece with a pretty melody. 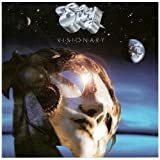 "Visionary" contains no real bad tracks, but no genuine surprises or memorable tracks either, except maybe "Age Of Insanity". For sure this new opus does not revolutionize ELOY's musical universe. However, despite its lack of originality and fantasy, this album is overall a pleasant listen. No ELOY VISIONARY reviews posted by members yet.